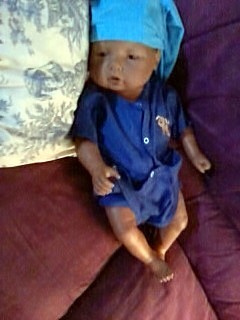 Last weekend, my son Justin, had an electronic doll at home that is programmed to act somewhat like a real baby. Its called "Baby Think it Through." It was for his parenting class at school. He named him Nicholas Cage Boakes. 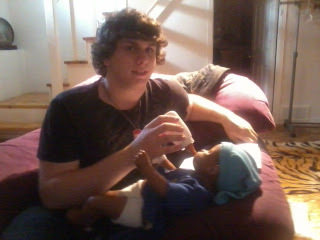 He had to wake up at all hours of the night to tend to his baby. I was slightly amused by it as I remembered the real thing! The baby is programmed to need 4 specific things, changing, feeding, burping or rocking. Like a real baby, you have to figure out which one it needs. Each time it would start to cry he had to swipe his daddy bracelet to the sensor on the back of the doll so it would record that he tended to it, then he had to try the bottle to see if it wanted to drink or rocking it, or burping it or trying the diaper to see if it needed changing. Justin did very well. He scored a 98% on the print out that it gave to tell how he did. I think that the "think it through" part works well. 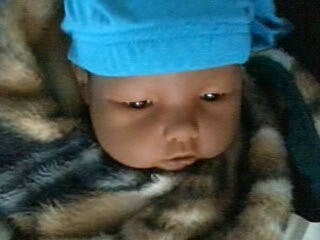 I am happy to say, that even though he scored high, he doesn't want to have a real baby to deal with any time soon! My niece Brooke, is totally into Spiderman. She is turning 4 on June 9th. Her and I have been having a little bit of banter about who is going to marry him, me or her. She's said I can marry Peter Parker but she will marry Peter (I think she doesn't quite get that they are the same person..lol) SO..I sent her this picture. Its my face, instead of Mary Jane's. I made it on on the website faceinhole.com. I sent it to her mom's email address and Brooke wasn't pleased. She told me that I couldn't marry him because she was. So, to make her happy, I made her another picture. I got to hear everything because we were on the telephone when she got the pictures! It took her a minute to realize it was her face. She gasped and said, "Is that me? When Im a grown up?" and her mother told her "yes!" Then she says, "I look great!" So, she thinks that when she grows up, she is going to marry Spiderman! Oh, to be 4 again! By the way, she told me I get to marry the Green Goblin, then changed her mind. I can marry Harry. Peter's best friend. Lucky me! Im convinced that the internet department of Northern Tel is run by a bunch of idiots. I have never seen such lousy internet in my life. Do they think that people don't notice the lousy service? People around here say they have the same problems as we do, but Im starting to think that Im the only person who calls to complain. Im tired of talking to technicians who read me the same series of questions. 1. Is the modem connected directly to a phone line without a filter? 2. Are you using the original phone cord provided in the box? 3. Are all the phones in your household connected with a filter? 4. Do you have a wireless router connected to the modem? YES, YES, YES, YES....geesh. We are using the "New" modem that they provided. We are using the original phone cord they provided. We have filters on every phone in the house. I purchased the 3 year extended warranty when I bought my router at The Source. Last month while we were having our probably 1 millionth problem with the internet, I went to The Source and exchanged my router for a brand new one. SO....YES...I have a wireless router connected to the modem, however...once again, it is not the router. If they want to prove its not the router why don't they just send me a modem with WiFi?? If they truly have kept a record of all the times I, and other people who live in this household have called them, then they should understand why tomorrow, when I call customer service, I will be demanding they give us a discount for the next few months to compensate for the lousy service of the past. I also have a voice mail from a technician (from the last time they opened a repair ticket) who kindly explained how the problem was at their end and how they changed a network card in their servers..blah blah blah. Oh ya, one more thing...not everyone in Northern Ontario speaks french. Get some technicians who speak fluent English.